"Limited edition" Twix Coconut, made in Russia, and sporting a snazzy wrapper. And here’s another entry into the coconut-chocolate category: Coconut Twix cookie bars. Intrigued? 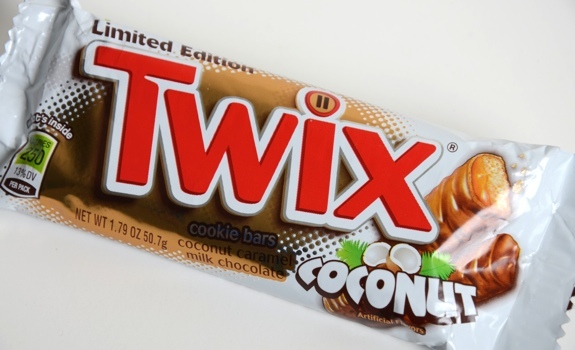 The Pitch: “Limited Edition Twix coconut cookie bars. Coconut caramel milk chocolate.” What more do you need to say? The Look: White and gold packaging, with a giant red Twix logo. It’s pretty. Inside the package, there are two finger-sized bars, each one covered in milk chocolate. The Taste: It tastes like coconut, but the telltale texture of coconut is nowhere to be found. According to the ingredients list, there’s no coconut in it. Odd. Each bar consists of a cookie and caramel core coated in milk chocolate — that’s it. It’s coconutty in a suntan-lotion way that reminds me of walking the beach at Waikiki. The chocolate is good, and the cookie is OK. On the whole, not bad. 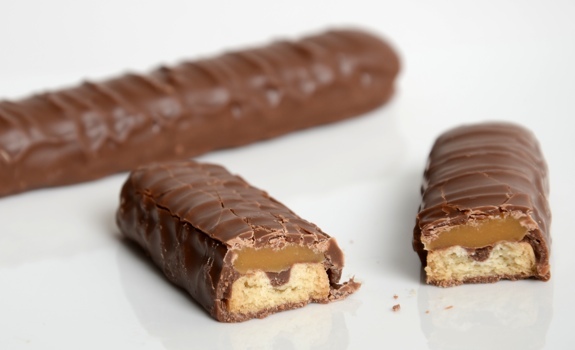 A cross-section of Twix Coconut. Cost: $0.69 (on sale) for a 50.7-gram (1.79 oz.) package at Walgreens in Seattle. Gifted to NEAROF! Value for cash money: At that price, amazing. Availability: America. Also, “limited edition”! Nutrition? : Per 50.7-gram package: 250 calories, 13 grams of fat, 75 mg of sodium, 1 gram of fibre, 2 grams of protein. From Russia, With Love? : Da! It’s right there on the label: Product of Russia. Neat! The verdict: Not my favourite chocolate bar in the world, but not bad, especially if you like coconut.